The RHM3003B is well constructed, and offers exceptional value for money, and works to a high standard. Mirrored door can be a little difficult to see through at times, particularly in bright sunlight. 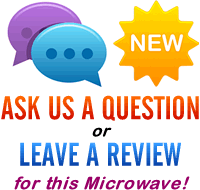 Looking to buy a large combi microwave? This RHM3003B model from Russell Hobbs offers a massive 30 litre capacity, together with a built in grill, convection oven and microwave facility, all for around the £140 mark. In terms of design, the RHM3003B looks pretty stylish, with a black exterior complete with mirrored finish to the door. 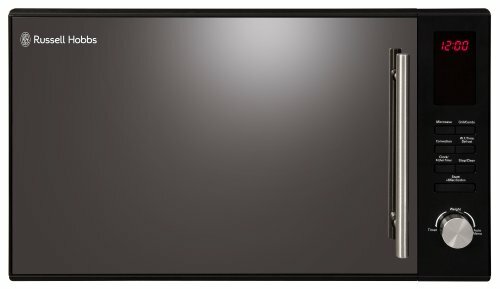 In fact the mirrored effect is pretty much our only minor complaint with this microwave - in brightly lit environments it can be a little difficult to view inside, without opening the door. This isn't so much of an issue in the average kitchen, and only affects the Russell Hobbs RHM3003B in direct sunlight. Asides from that it performs very well, as you'd expect from a manufacturer such as Russell Hobbs - the interior is very spacious, and the controls are subtle, yet simple to use, and well labelled. The seven buttons control the various functions on the Russell Hobbs RHM3003B, with the timing duties and menu cycles controlled by the main dial situated underneath. Depending on which function you were trying to operate, some of the testers found the button sequence a touch long winded, but we all got the hang of it fairly quickly, and it wouldn't put us off buying. The built in grill is pretty powerful at 1100w, and performed very well during our testing period, leaving food crisp and nicely browned. The Russell Hobbs RHM3003B's convection oven heats up in a fraction of the time it usually takes a regular kitchen oven, thus saving you time and using less energy, which will help to cut down on your electricity bills. The 31.5cm glass turntable is removable for easy cleaning, and the digital display is easy to read. The interior cavity is pretty large, given the turntable size and overall 30 litre capacity, and so the RHM3003B will cater for the majority of larger dishes as well as handling smaller plates with ease. Externally the Russell Hobbs RHM3003B measures 33.5cm by 52cm by 51cm, and so will be compact enough for the majority of kitchens, although as with all larger microwaves, it is worth measuring first. Finished in black, it looks smart, with silver detailing in both the handle and dial.Our testers were complimentary about the design of the RHM3003B - granted it doesn't look quite as impressive as some of the high end combi microwaves on the market, but given the low overall price and feature list, then this is totally understandable. Overall this combination microwave performs to a high standard and should offer you years of uninterrupted service, based upon both our successful testing period, as well as our overall experiences with Russell Hobbs' microwave ovens. It's ideally suited for larger households, given the generous 30 litre capacity, and the versatility of this appliance is a huge selling point, especially considering the low overall price tag. If you're looking for a spacious budget combi microwave, and one that offers enough room for large dishes, then the RHM3003B from Russell Hobbs is well worth considering. It offers an extensive feature list for a relatively low price tag of around half that of some of it's competitors. We highly recommend the RHM3003B to our readers.